I’ve driven by the Preacher Smith Monument just off Highway 85 about a mile before Deadwood, hundreds of times. I finally decided to take a look. If you get to the turn for the Lodge at Deadwood, you drove past it. 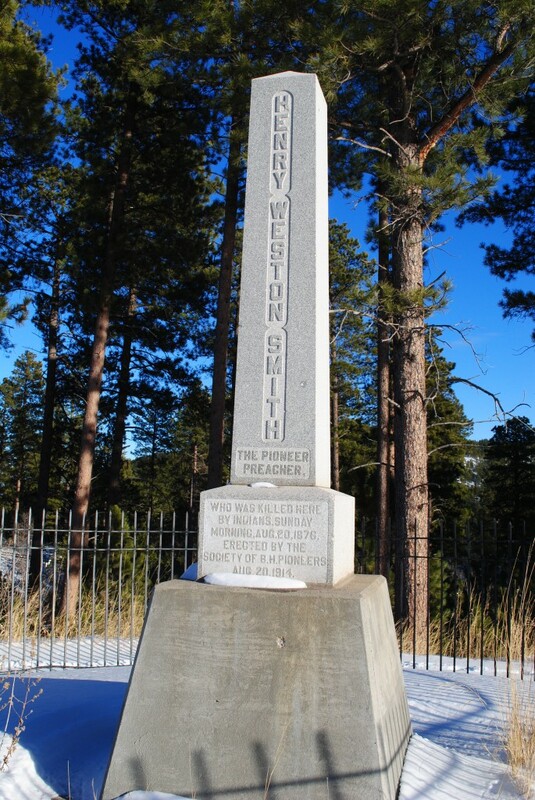 It is a simple monument erected in 1914 by the Society of the Black Hills Pioneers (they also erected the Friendship Tower on Mount Roosevelt) at the approximate site where his body was found. When Highway 85 was upgraded to a four-lane road in 1994, the monument was relocated to it’s present location. Sunday August 20, 1876, Smith left a note on his door says he was going to Crook City to preach and he never returned. The death was blamed on native Americans, but many believe he was murdered by people who didn’t share his beliefs(casino, brothel and saloon owners). He is buried at Mount Moriah. The views are beautiful from the monument and I believe there is a geocache near by. Next time you drive by, pull over and pay your respects to Preacher Smith.